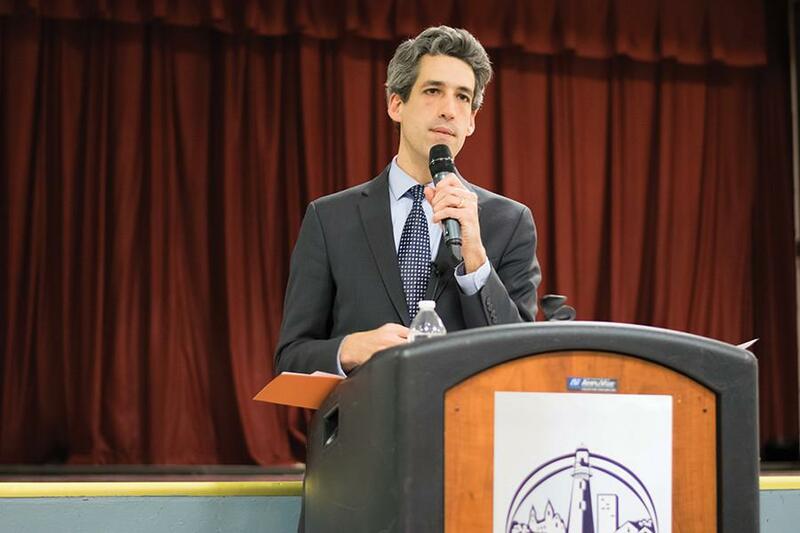 State Sen. Daniel Biss (D-Evanston) speaks at a town hall last month. Biss said in a December hearing that government had a responsibility to care for the vulnerable. Illinois lawmakers introduced several bills at the end of January to address problems with group homes for adults with disabilities. The proposed bills would strengthen licensing requirements and oversight for group homes in Illinois. The bills follow an investigation by the Chicago Tribune published in November and December exposing substandard living conditions and neglect in group homes. The state’s group home system covers more than 12,000 adults with intellectual and developmental disabilities. The Tribune investigation highlighted cases of neglect and problems at homes run by Disability Services of Illinois, which runs a private network of group homes serving residents in Chicago and the south suburbs. Following the investigation, state officials revoked the license for Disability Services of Illinois, citing “imminent risk” to residents. Four of the six bills would require state group homes and other community-integrated living arrangements to maintain contact information and pictures of residents, allow unrestricted state access to residents undergoing transitions to new homes and establish an attendance and destination log to track when residents choose to stay somewhere else overnight. “There is literally nothing that matters more in government than caring for the vulnerable — the task that we haven’t done nearly well enough,” state Sen. Daniel Biss (D-Evanston) said at a December hearing following the Tribune investigation. One of the bills, introduced by state Rep. Terri Bryant (R-Murphysboro), seeks to change the hiring process for new investigators at the inspector general’s office of the state Department of Human Services. The Tribune investigation discovered shortcomings in two neglect investigations by that office. At a hearing last year, inspector general Michael McCotter, spoke about struggling to investigate group home complaints due to a requirement mandating investigators be hired on seniority rather than qualifications for the job, Bryant told The Daily. “(This bill) actually makes them have to have an interview process, rather than the most senior (person) automatically getting the job,” Bryant said. State Rep. Patricia Bellock (R-Hinsdale), deputy minority leader in the Illinois House of Representatives, introduced several of the bills, including legislation that gives the DHS power to extend the provisional period of a new group home license to two years from the current six months. The extended time period would give the DHS more time to audit and ensure group homes are providing adequate services to residents. Robert Okazaki, executive director of Avenues to Independence, a Park Ridge-based organization that provides job and housing opportunities to adults with developmental disabilities in the Chicago area, said his organization already follows the requirements that the proposed legislation would set up, and is upfront in reporting any incidents to the state. He is hopeful the proposed legislation will ensure other group home operators do the same, he said. “If everybody is not on an equal footing in terms of what’s reported, (then) some entities may look way better than others,” Okazaki said. Though the proposed legislation may help solve some problems with group homes, Okazaki said, the root of the issue involves the continued lack of state funding for group homes and human service providers in Illinois.